Providing the San Francisco area with professional, fast and eco-friendly junk removal services. Kitchen remodeling jobs involve a near constant need for on-the-go cleaning. You can’t start the next step of the process with a pile of construction debris at your feet. The trash will be too much to bag up and place at the curb, and you probably cannot wait until the end of the project to use junk removal services. That’s why it’s easiest to rent a dumpster so you can toss things aside. Scrap Wood: Tearing out wood from cabinets, drawers, countertops, or floors? Most scrap lumber can be recycled. Rent a dumpster and toss it in, and let Junk King take care of separating all the metal fixtures. Dishwasher, Refrigerator, and Appliances: Let Junk King take care of reuse and recycling for these bulky items. If your dumpster has a side opening, like the Junk King MINI, you can wheel large appliances into it using a hand truck or dolly. Countertops: Don’t want your stone countertops anymore? Leave them intact for donation! 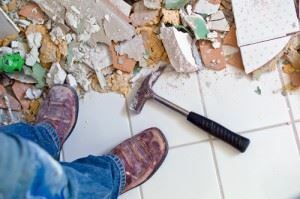 If you have stained or damaged countertops, especially old tiles or butcher’s block counters, you’ll definitely want to rent a dumpster to break them down into large pieces and toss them. Drywall, Baseboards, Windows, Etc. : Everyone loves the fun part of sledgehammering and demoing things down to the bones! A dumpster rental gives you a place to gather the debris and keep your work area tidy. Your other options for kitchen remodel waste removal include using a junk removal service or doing it yourself by hauling everything to local landfills and recycling centers. Ask anyone who has done a major home improvement project like a kitchen or bathroom remodel, and they’ll tell you to rent a dumpster for ease and convenience. Go at your own pace! Junk King lets you keep the MINI dumpster for as long as you need. Reduce stress by scheduling your dumpster removal appointment whenever you want, and simply let us know if you want to delay the pick-up. Don’t haul trash in your own vehicle! Scrap lumber, kitchen appliances, nails and screws, and all the other debris can be hazardous to carry and can easily damage the interior of your vehicle. Keep your driveway safe! Junk King designed the MINI to be driveway-friendly so homeowners could rent a dumpster for DIY projects like kitchen remodeling. The MINI is 8-feet wide and sits neatly on your driveway after our team carefully places it in your preferred location. Rent a Dumpster from Junk King, Pay for the Space You Use! Junk King offers one more way that it’s better to rent a dumpster for a remodeling project. We let you pay only for the space you use if you don’t fill up the whole container! This makes Junk King the most cost efficient option for remodeling debris removal for smaller projects. Only replacing the cabinets? You may not need a whole 12-yard roll-off container. Most of the other guys will charge you their flat maximum rate for dumpster rental. With Junk King, if you produce less waste for us to haul away, we’ll let you pay less. Rent a dumpster from the #1 rated junk removal service in the country, Junk King. We were founded right here in the San Francisco area in 2005. Over the years, we have become the greenest junk removal company with the best customer service. Whether you prefer to rent a dumpster or call for full-service junk removal, Junk King gives you the options you need to tackle a home remodeling project. Book online to save $30 or call 415-335-7970 to schedule an appointment or ask for more info about dumpster rental! This entry was posted in Uncategorized and tagged Junk King San Francisco, junk removal, professional junk removal services on June 30, 2017 by Julian Torres, "JT". Last updated November 24, 2017 .